Two days ago, Kara Zor-El had visited her friend Siobhan Smythe to tell her she was leaving Earth. Siobhan found the Maid of Might's angst irritating until she learned that her alien pal is dying of Kryptonite poisoning. Kara says her goodbyes and flies away before Siobhan can apologize. Now, Supergirl is in space on starcycle stolen from Doctor Veritas called KR-1. Voices are crying for help throughout the cosmos as what appears to be a planet explodes in front of Supergirl while Veritas fails in convincing her to return to the laboratory to find a cure for the Kryptonite. Later, Kara is riding through the galactic highways while someone with a mysterious agenda watches her via monitors. Whoever this being is wants to see what kind of hero Kara is. He or she is certain to give Supergirl an adventure she will never forget. Kara finds herself on the planet I'Noxia. The inhabitants are being attacked by a giant cyclops monster with large teeth and claws called a Crix. The Girl of Steel defeats the beast while a henchman of the being testing Supergirl disguises himself as an old man called Delacore to win her trust. After all is safe, Delacore begins to tell Kara that everything and everyone on I'Noxia can reconstruct themselves. In addition to that, the entire world and those on it can be nearly anything or anyone. Kara gets an example of this by seeing Delacore become a heroine from Kara's favorite childhood story - Val-Ro, a warrior woman who tamed the lion-like creature Dramonicus. Val-Ro is even wearing a family crest shield like Kara's. I'Noxia knows very little of Krypton beyond its language making it impossible for it to become Supergirl's homeworld. However, before The Lost Daughter of Krypton can agree to help the I'Noxians, she is greeted by a strange surprise. Someone who looks like her cousin Kal-El with cybernetic body parts greets her. What does this Cyborg Superman want with Supergirl? Only next month's issue can answer that question. Story - 3: This was a difficult issue to rate. That's partly because it is a decent story and partly because it's hard to gage the direction Michael Alan Nelson wants to go with it. As a whole, this particular issue feels like pieces are missing from the plot similar to gaps in a memory. It is the beginning chapter in the first full story arc for a new writer (Nelson continued where Mike Johnson left off with his debut issue last month), so I will cut Nelson some slack. Yet, much of what went on felt too random and thus, disrupted the pace of the entire final product. I sincerely wanted to enjoy this one more, but the majority of it is just too disconnected for my taste at this point in time. Admittedly, I'm a big fan of the Cyborg Superman. Yet, I have to wonder why Supergirl was chosen as his New 52 debut book. Action Comics or Superman would have been more appropriate in my opinion. Still, As with other elements in this comic, I'll give Michael Alan Nelson the benefit of the doubt. I can only hope the next issues in this story arc are an improvement to this one. Art - 4: The art is great from a visual standpoint. However, I feel like Diogenes Neves is trying to mirror Gary Frank's style. His work on other comics seems different somehow to my eyes. I could be wrong though. In every case, Neves does a fine job even if I miss Mahmud Asrar interiors. Cover Art - 4: Artistically, we have a great image. Yet, I'm forced to knock off a point for false advertising. 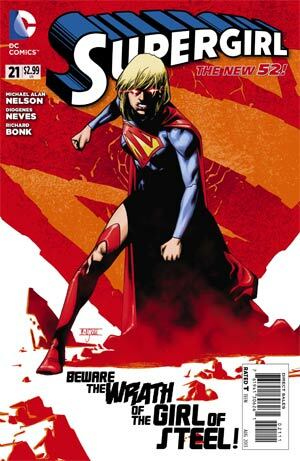 The cover leads us to believe that Kara is going on a rampage. That just doesn't happen in this issue. Shame on you DC for misleading readers.